The ruby-throated hummingbirds are filling in the southern areas of the United States. In February, the ruby-throated hummingbirds were first seen in the Gulf of Mexico area around Mississippi and Florida. The destination for some of these tiny creatures will be as far north as Nova Scotia, Labrador, Saskatchewan, Alberta and Manitoba. To see the hummingbird’s progress so far, go to the Ruby-Throated Hummingbirds Spring 2011 Migration Map. On March 25th, the ruby-throated hummingbirds were spotted in Ohio for the first time this year. 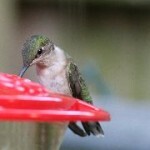 Last year the ruby-throated hummingbird traveled west into the mid section of Texas. How far west will they venture this year? It will be interesting to see! Watch the ruby-throated hummingbird migrate around the Allegheny Mountains. 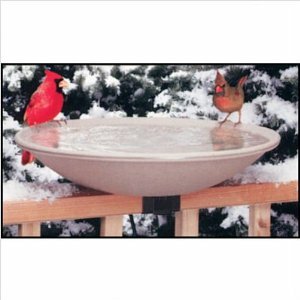 They will go around the mountain areas in parts of Virginia, West Virginia, Pennsylvania and Maryland. Will they take this route this year? Did you know these facts about the ruby-throated hummingbird? Their heart rate can get up to 1260 beats per minute and the hummingbird has the largest brain percentage-wise in relationship to total body weight. 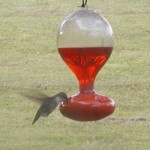 It’s not too early to put the hummingbird feeder out. They will definitely need a few sips on their way up north after their long trip from Mexico or Panama. Visit my other posts for more information on Ruby-Throated Hummingbird Spring 2011 North American Migration and prepare your hummingbird feeder for the Ruby-Throated Hummingbird.